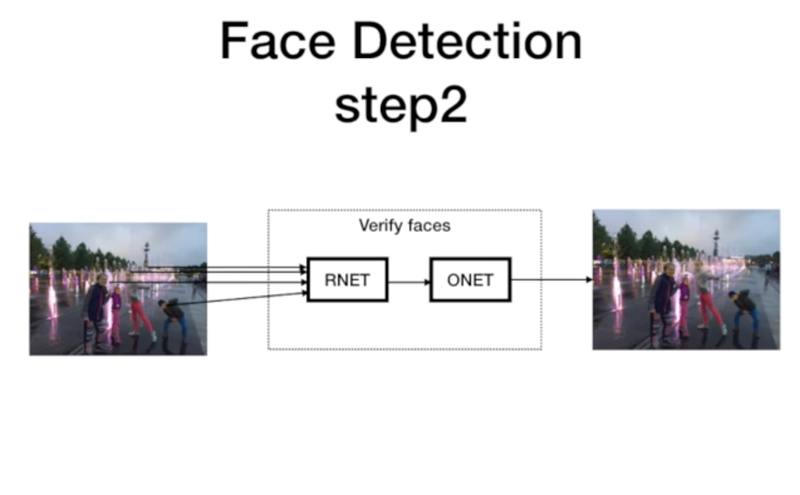 This tutorial is a walk through an end-to-end AI project creating a face detection and recognition application in Kibernetika. We will begin by selecting data sets creating a project and selecting models, setting up the infrastructure, training those models, and completing by re-training for future proofing. Before we begin, let’s first address that there are two main steps to this project - face detection and face recognition. First, to detect that A face actually exists in the image and, second, to then recognize a specific face. 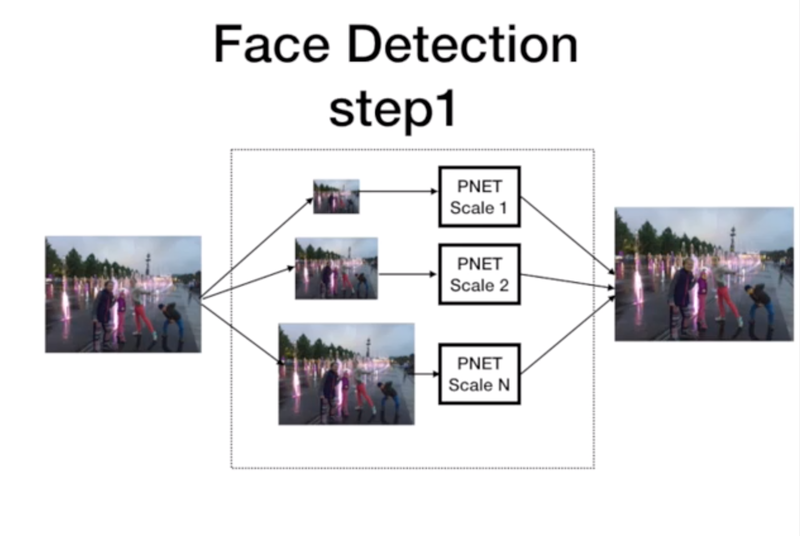 Face detection includes Pnet, Rnet, and ONet neural nets to define face boundary boxes on a picture. 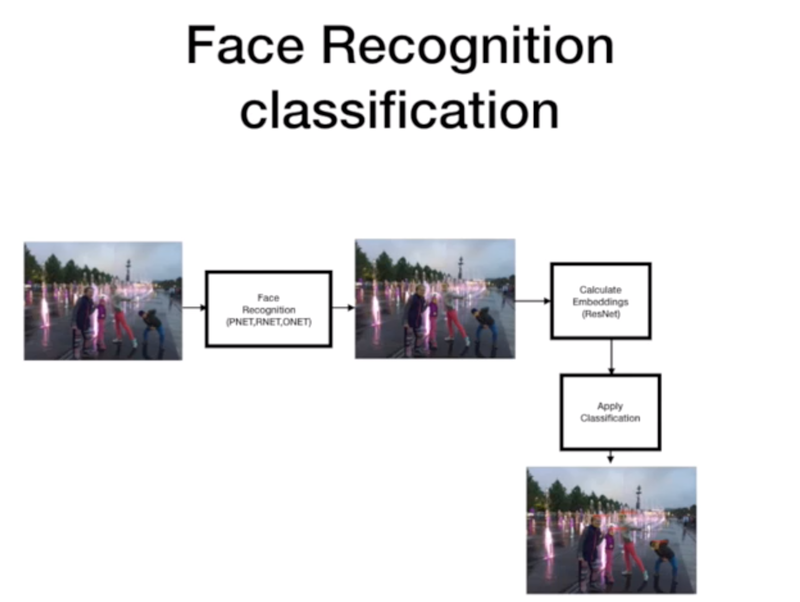 Face recognition includes calculating face embeddings using Inception ResNet model and training SVM classifier. Start by creating a new dataset. In Kibernetika platform, we can do this using Web UI, CLI client or provided API. We will use Web UI. Once we have this data set, we can go ahead and create a project. ATTENTION: You MUST switch dataset during installation to your personal datasets that we created on the previous step!!! It is very important this project want work with datasets form other workspaces!!! The project is now available to use. 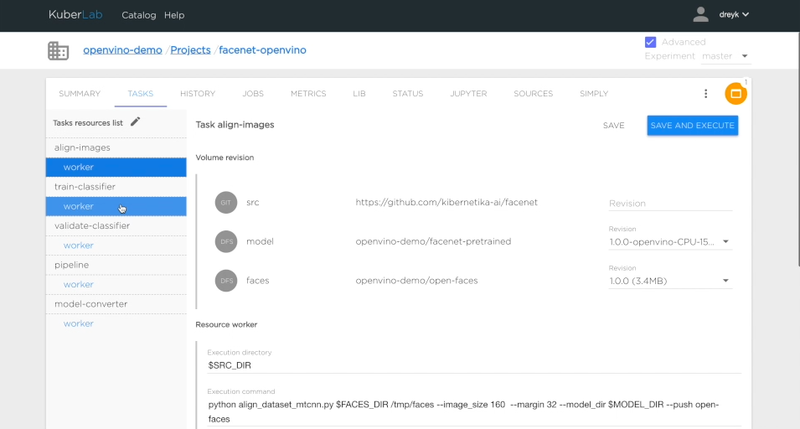 NOTES: you can skip this step because our facenet model from catalog already has model in OpenVino format too. Once model is converted the new model files now existing in the your personal model catalog. From here, we will switch over to use the generated openvino model. NOTES: make sure that you choose new created model from your current workspace. 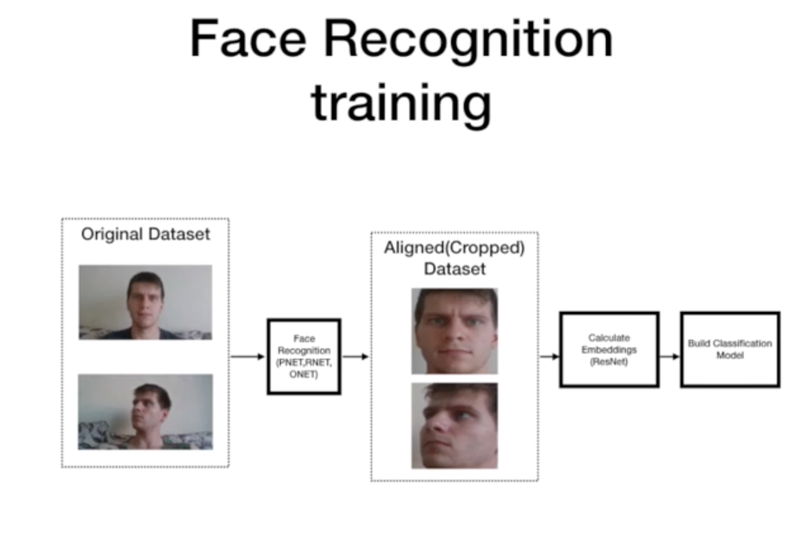 This brings us to the next part of the project, when we can actually start to train the face recognition model. This includes 3 sub tasks that we cluster together into pipeline task - Align images, train SVM model, and validate results. NOTES: Use pipeline task to build model. This task will automatically start align,train and validate tasks. Otherwise you need adjust parameter of each task, default parameters suitable only for whole piplene. Align performs cropping and will create a new version of the dataset that contains only cropped images. 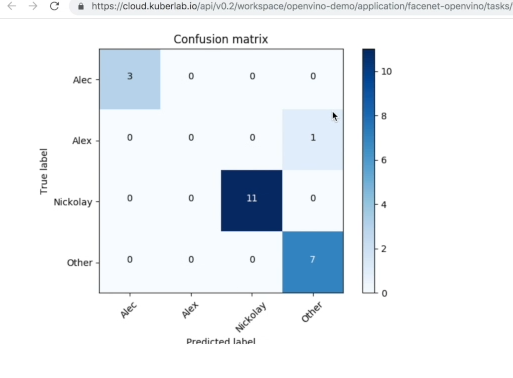 The next task is to train SVM classifier using Inception ResNet and openvino inference engine. And the last task is validating the result and uploading the new model to model catalog. 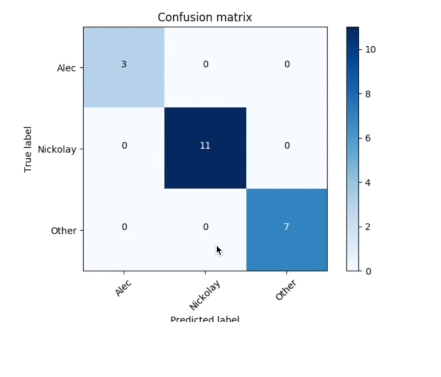 At this time, we generate a confusion matrix (confusion matrix keras) after the model validation to understand how accurate our new model is. After the model is built, we can start the inference portion of this project. Also new facenet-classifier model will be pushed to Model catalog after our pipeline is done and validation was succeeded with accuracy more than 0.9. You can start serving directly from Model catalog. Serving parameters. Required only for testing using Kibernetika UI. Choose version that you want to serve and press SERVE verify that all required parameter is filled as on previous step (sometimes it may require refresh page). NOTES: by default one additional volume model will be added automatically to your serving configuration that will be refer to current(selected) version of model. Don't remove it. Since data is likely to change over time in the real world, we can easily extend out the original dataset and continuously retrain the model. We call this Continuous Production and is a core funcion of the Kibernetika platform. 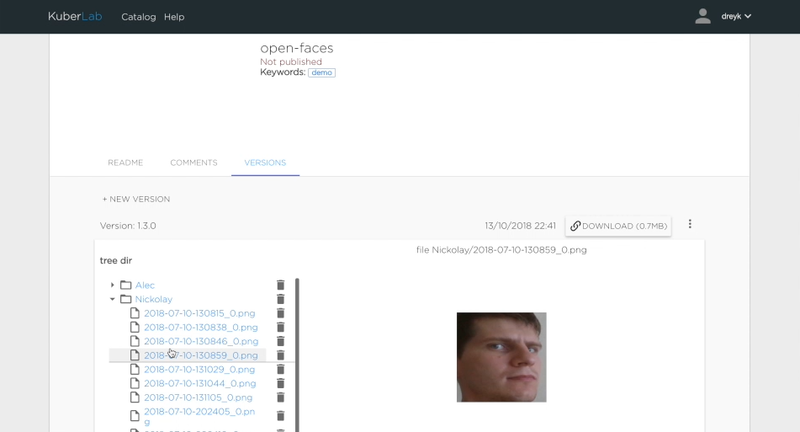 Simply set up a new version, 1.0.1, add another person, Alex, and some images for that person. Reopen the project, switch the dataset to the new version and rebuild the model. 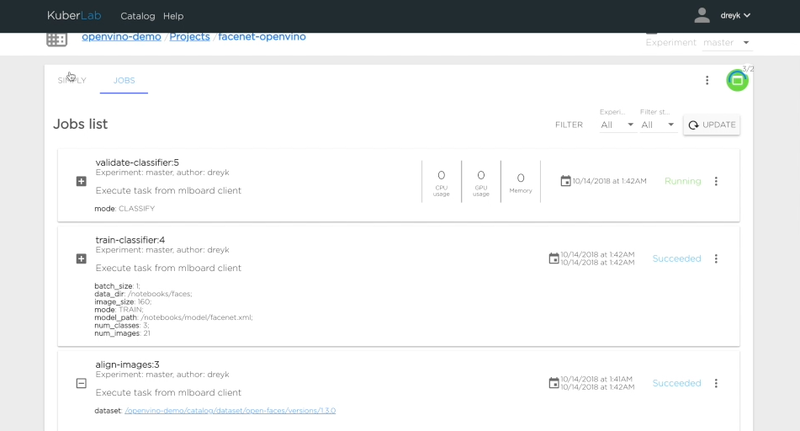 Again, once re-training and validation completed, you can see the model accuracy and then make informed decisions about deploying the new model to production. And, as a collaborative platform, you can easily share results, models, data, etc. with team members for a seamless rollout. For more information on how you can accelerate your AI project with Kibernetika, reach us at info@kibernetika.ai today!